The Genetics Society of America (GSA) is pleased to announce that Philip Hieter is the recipient of the 2018 George W. Beadle Award, bestowed in honor of his outstanding contributions to the genetics research community. Hieter is Professor of Medical Genetics in the Michael Smith Laboratories at the University of British Columbia. Geneticists across the model organism and human genetics communities recognize Hieter for his dedication to uniting human biologists with those who work on model organisms such as mice, fruit flies, worms, and yeast. The resulting collaborations are crucial to advancing our knowledge of biology, including human health and disease; connecting model organism researchers and human biologists with one another speeds progress for both groups, facilitates mechanistic understanding of disease gene functions, and helps uncover novel disease mechanisms and candidate therapeutic targets. In 1997, when few genome sequences were available, Hieter helped create XREFdb, a public database that linked the functional annotations of genes studied in model organisms with the phenotypic annotations on the human and mouse genetic maps. This resource provided cross-species candidate genes for mammalian phenotypes, including human diseases, and stimulated interactions between basic scientists working on various organisms and the medical genetics community. He has also founded and co-led several multidisciplinary meetings that bridged the gap between biologists working on humans and those working on model organisms. Hieter and Jeannie Lee, a professor at Harvard Medical School and the Massachusetts General Hospital (and 2018 GSA President), were co-chairs of 2016’s Allied Genetics Conference, which brought together over 3,000 attendees from seven different genetic research communities to exchange ideas and findings. As the 2012 GSA President, Hieter continued to foster closer relationships among different groups of life scientists. 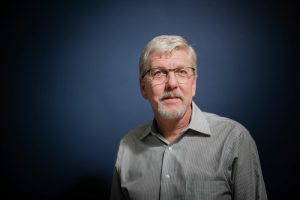 “As president of the GSA, Phil had a strong focus on bridging the many separate communities of the Society as well as increasing the interactions of the GSA community with members of the human genetics community,” says Stanley Fields, professor at the University of Washington and 2016 GSA President. To help biological insights reach patients, Hieter co-founded, in 2014, the Canadian Rare Diseases: Models and Mechanisms National Network, a consortium that connects clinician scientists identifying gene mutations in patients that cause rare diseases to basic scientists analyzing the corresponding genes in model organisms. This network funds pilot studies to expedite collaboration between the two groups, conduct model organism-based functional studies of disease gene variants, and develop new therapeutic strategies using model organisms. In addition to having connected research communities, Hieter and his lab have made many significant contributions to our understanding of chromosome biology, including the dissection of yeast centromeres and the identification of genes involved in genome stability. Their contributions to the yeast community include physical mapping methods, synthetic lethality screen approaches for identifying cross-species candidate genes as potential cancer drug targets, and a widely used set of vectors and yeast host strains that have been instrumental in work that has led to countless discoveries in recent decades. The George W. Beadle Award was created by GSA to honor the memory of George W. Beadle (1903–1989), the 1946 GSA President. Beadle and his colleague Edward L. Tatum were awarded the Nobel Prize for Physiology or Medicine in 1958 for work that linked genetics to biochemistry, providing a major part of the foundation for the field of molecular biology. In addition to being a GSA President, Beadle served society in several leadership roles—for instance, as chairman of the National Academy of Sciences Committee on the Biological Effects of Atomic Radiation—and demonstrated a strong commitment to science outreach and education. The Prize will be presented to Hieter at the 2018 Yeast Genetics Meeting, a GSA Conference to be held August 20–26 at Stanford University.